« The Who at Manchester Arena! I mention this with my tongue firmly in my cheek and the title of this blog is also meant “tongue in cheek”. So what’s all this about? 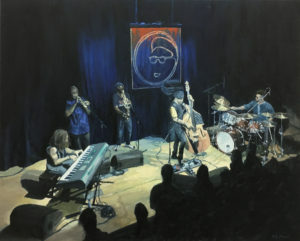 Well, I think I may have finished a painting inspired by an incredible night at Band On The Wall, Manchester way back in July 2017. Here is “Miles Mosley And The West Coast Get Down” oil on canvas…possibly finished..